For the past months I immersed myself in stories of Muslim women, learning what inspires us to resist and to exist in these times of national chaos, global catastrophes, and day to day struggles. My resistance purses are portraits of contemporary human struggles and triumphs. They are empowering, bold, and collaborative, fueled by our collective passions; they serve as a documentation of an era in which voices are silenced, yet, remaining silent is not an option. This is an ongoing project that seeks to re-contextualize how we view protest, and allows insight into the hearts and minds of a diverse community of women. 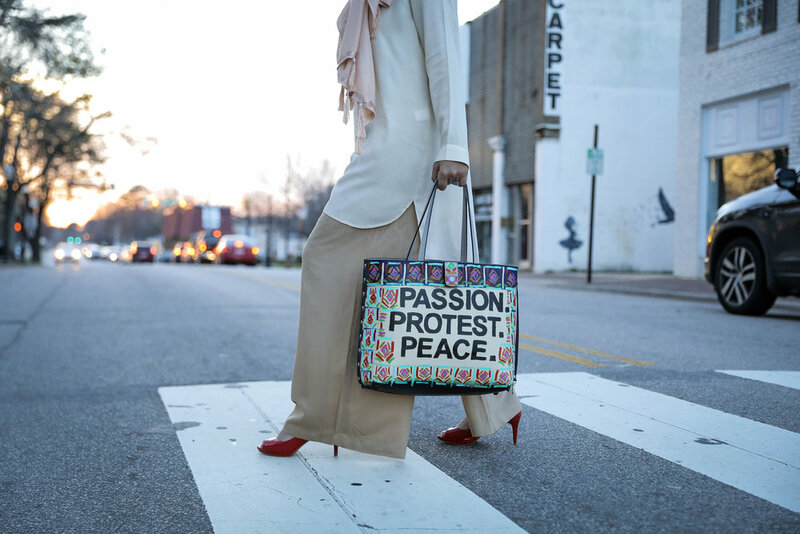 And I couldn't have thought of a better partner than photographer-friend Caroline Cockrell to join me on this journey called The Protest Purse. An exhibition of photo-based object works where each piece requires a physical action from the viewer to be fully experienced. This art is made to be touched. 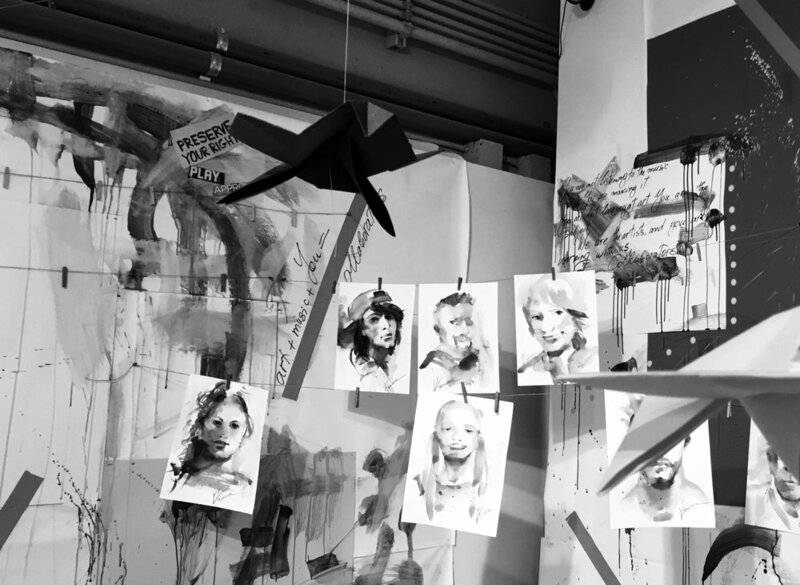 The exhibition features the one-of-a-kind assemblage and installation pieces by Addison Brown, Brooke Caudle, Heidi Kirkpatrick, Tobia Makover, and Lori Vrba. When we see the word “collaboration,” we think of each other. Throughout changes to our families, identities and approaches to art-making over the last four years, we continue to share ideas and dream of our future as artists and friends. The work you see around you is our attempt at using our art-making to work through the questions and struggles in our lives at this moment, and to explore ideas about the identities and veneers we have worn, shed, cultivated, lost, clung to, or will never experience. Recurring dream is collaboration between poet Katie Byrum (Brooklyn, NY), and visual artist Jade Hoyer (Minneapolis, MN). Byrum’s poem, To the River House (recurring dream), is a poignant work on coming-of-age, of quiet hometowns and nostalgia. Inspired by Byrum’s work, Hoyer addresses these ideas through printmaking (woodcut and silkscreen) and installation. 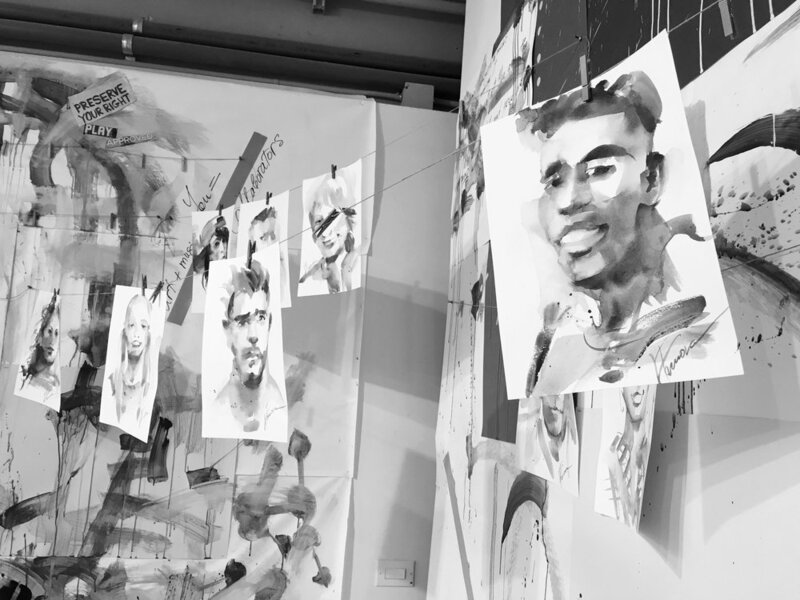 Liz Kelly and Sarah Tector have come together in this collaborative effort to explore their mutuality while pushing each other towards new ideas. Tector is known for her clean, geometric and architecturally influenced jewelry and Kelly for her elegant and strong functional pottery. Turning their attention towards home adornment, H U N G explores pendant lighting and functional wall pieces. This exhibit reflects a partnership of craftspeople exploring new processes and each other’s visual language. Join us as we celebrate the unique people and landscapes of Eastern North Carolina. North Carolina’s coastal plain has a fertile landscape and rich agricultural and cultural history. Yet, the counties between Interstate 95 and the coast remain a blank spot on many North Carolinians’ mental maps. Most experience the region as a blur of pine trees, fields, and gas stations as they rush towards the beach. What can we learn by slowing down and engaging Eastern North Carolina in a conversation on its own terms? Click here to continue following the conversation on Facebook. I have been collecting clothes from friends, family and my previous exhibitions visitors. These clothes are the matrices for my monoprints on fabric. Most of the clothes have a story, they were worn for a long time, the person who owned the clothes had an emotional attachment to it, they only used them in special occasions, etc. What I noticed is that those clothes have one thing in common: they are stories of relationships. A material reminder of an interaction with a living person, with someone they missed or a particular situation in their lives. I believe that what I transfer to the substrate (a piece of fabric, a reclaimed sheet) is not only the material image but also part of the memory|energy of the clothes and their owners|users. A community art project inspired by Langston Hughes' poem, "Harlem"